The annual Calgary Stampede parade kicks off at 9 a.m., and road closures along the route downtown start at 7:30 a.m. The Calgary Stampede fun kicks off officially on Friday with the parade — so enjoy the show, but don't forget there will be a few road closures in the downtown. Spectators can take in agile dogs performing stunts, a heavy horse show and freestyle motocross starting Thursday evening in the Sneak-a-Peek, along with other events and musical acts, such as Alexisonfire and Gord Bamford. The official Stampede start-up is on Friday with the much-loved parade beginning at 9 a.m., although parade prelude activities begin at 7:30 a.m. The parade, led by the show band, follows a 4.5-kilometre route through downtown Calgary over a period of two hours. CBC Calgary's Doug Dirks and Angela Knight will host the show. Heartland's Graham Wardle, who plays Ty Borden, will report on the parade from the sidelines. If you can't make it to the parade, don't despair. You can tune into the CBC's live online starting at 9 a.m. here or by going to the CBC Calgary home page, the CBC Sports Stampede home page and our Facebook feed. You can also tune into CBC TV starting at 9 a.m. The parade will be broadcast again on Saturday at 10 a.m. on CBC TV. Follow CBC Calgary online via the Calgary Stampede 2018 live blog for all the latest updates and join the conversation on social media by tweeting @CBCCalgary with the hashtag #GiddyUpYYC. You can also tweet @cbcsports with the hashtag #Stampede2017. If you're driving downtown, you'll want to head out early. Ninth Avenue westbound from First Street S.E. to 10th Street S.W. 10th Street S.W. from Ninth Avenue S.W. to Sixth Avenue S.W. Eastbound Sixth Avenue from 10th Street S.W. to Third Street S.E. All the routes are expected to reopen by 2 p.m., according to the city and Stampede websites. Then you can head on down to Stampede Park, where admission will be free from 11 a.m. to 1:30 p.m. Try out the new zipline, a whole menu of quirky foods and the favourite Chuckwagon Races. 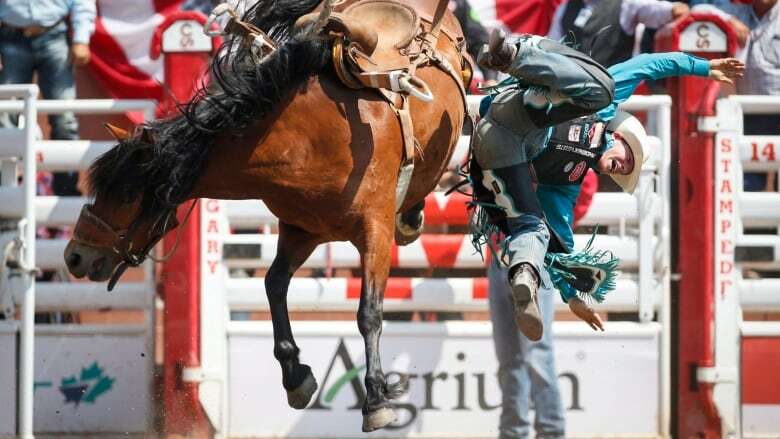 "Truly our volunteers and employees have been working around the clock since the last day last year to plan this event, and there's so many new attractions and events and opportunities," Calgary Stampede president David Sibbald told the Calgary Eyeopener. The forecast for Friday is for sunshine with a high of 30 C and UV index of 10 or very high, Environment Canada says. Parade goers are encouraged to wear waterproof sunscreen of 30 SPF or higher, reapplying frequently, and to drink lots of water. Alberta Health Services is recommending people wear a wide-brimmed hat, sunglasses and long-sleeved shirts to cover skin, and to bring a backpack with water, extra shoes, healthy snacks and sunscreen. The health authority says to watch for symptoms of heat exhaustion and sunstroke, such as feeling dizzy, nauseated, disoriented or faint, and having a high body temperature or lack of sweat. EMS paramedic teams will be available along the parade route. The warm, sunny weather is expected to continue for much of the outdoor show. Even if it does rain, Sibbald said there are many indoor activities available, which are detailed on a map and schedule online. Also check out the pancake breakfasts throughout the city and peruse the list of items you should leave at home when you go to Stampede Park. "Bring anything you want but don't bring anything you wouldn't bring to an airport," Sibbald said. The Stampede has implemented some new security measures, including metal detectors and vehicle barriers. CBC will offer broadcasting throughout the Stampede, as well as extensive coverage online atcbc.ca/sports/calgarystampede. Calgary Transit has two C-Train stations near the Stampede grounds, and while the LRT is free downtown, the transit authority is also offering discounted passes during the Stampede. Parking will be limited, so organizers are encouraging people to choose public transit. A number of parking lots will be closed, as well. Lot 62 at 407 Ninth Avenue S.E. Lot 62B at 363 10th Avenue S.E. Lot 55 at 724 Fourth Street S.E. Lot 66 at 830 Ninth Avenue S.W. Centennial Parkade at 608 Ninth Avenue S.W. and 823 Fifth Street S.W. Convention Centre Parkade at 727 First Street S.E. Arts Commons Parkade at 829 Macleod Trail S.E. Lot 7 at 208 Ninth Avenue S.W. Lot 91 at 610 Third Street S.E. City Hall Parkade at 322 Ninth Avenue S.E. Anyone who wants to attend the Stampede is encouraged to dress the part with blue jeans, belt buckles, boots, hats and neckties, if you're so inclined.